With summer nearly upon us we have already been hit with several days where temps almost hit triple digits. It's also given everyone their annual reminder on our anniversary to recount how hot it was on our wedding day. It's always nice on the anniversary of one of the most important days of your life to be reminded by everyone you know that they only memory they have of that day was the uncomfortable heat, not the joyous celebration of love. Before the heat hit I had promised the boys we could go on a Pokemon hunt. Unfortunately that day ended up being rainy and cold but they had very few complaints. Birthday party season has been ramping up so we've had some hectic weekends including this day where the boys had to quickly draw birthday cards for their friend after swim class so we could rush to his party. Eighty percent of their class was born in July so we may just both need to take the entire month off of work. So far 2017 has been the year of the Colossal Squid fighting the "Squirm" Whale. Martin is captivated by the rivalry between these two animals and spent much of the last month drawing pictures of epic struggles between the two sea creatures. Martin has also been obsessed with hockey which means he has spent a lot of time taking pictures of hockey on the TV so he could later draw pictures of the hockey players. On Mother's Day there was much gardening done where Elliott dutifully helped Grandad weed our often neglected vegetable garden. Mother's Day was a lot of fun, mostly because I got to avoid doing any of the gardening. 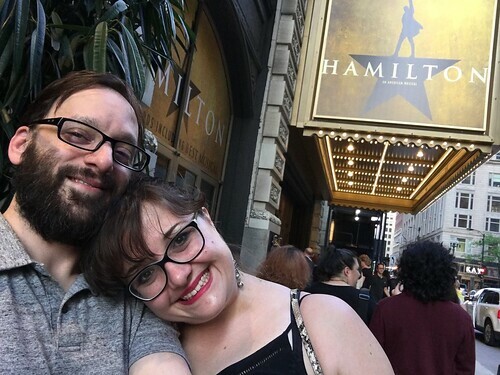 Shortly thereafter we finally got to go see Hamilton. The key to easing the blow on the monetary investment for Hamilton is that you have to buy the tickets so far ahead of time that by the time you go it was so long ago that it feels like you're getting to go for free! We also took the kids to Civil War Days for the first year since moving here in hopes that they'd be old enough where the cannons and guns would not startle them. This was trye for the boys though Josie was still not a huge fan. The boys even got to see what it was like to be barked at by a 1860s drill sergeant. It was pretty amusing to watch. Josie elected to just eat a donut rather than participating. They also completed their season of skating lessons which we celebrated with pizza dinner with Grandma and Grandad. On a really nice day we even headed downtown for another Pokemon hunt. After a long winter and mostly rainy spring the boys were very excited to get out there and catch some new monsters. We also took them to the zoo where they got to experience the new dinosaur exhibit which the boys really loved. Josie was a little less excited about the animatronic dinosaurs. They boys also had their graduation from Pre-K which we again celebrated with a pizza dinner. There's something a little anticlimactic about having a Pre-K graduation on a Friday. Perhaps it's the fact that they have to go right back to school on Monday. Jen went out of town for work so we decided to surprise Mummy by building her a shed for her gardening supplies. Elliott and Josie were a huge help. Mostly they just wanted to sit inside it as I built it or play hide-and-seek where they closed the doors, told me to find them, then got upset when I found them. Martin helped by creating a football team called The Lions by drawing a lion and putting it over the logo of one of his jerseys. He then also made me fashion him a football helmet and downloaded a strange game where you make a football team then just watch them play a simulated game. We also went to the Cavalcade of Planes for our third time since moving here. Mostly the children just complained about how hot it was and melodramatically threw themselves around. They were so dramatic that I thought they were coming down with something. Martin went straight to bed and watched Wild Kratts as soon as they got home. Elliott played Super Mario Bros. on my newly hooked up arcade system. Soon Martin was enticed to come downstairs and, of course, convince his brother that they both needed to dress up like the Mario Bros. if they were going to play. It's been nice to once again walk to school on a daily basis and take advantage of the beautiful weather. Even if it means their procrastination and general lollygagging means we're late every day. 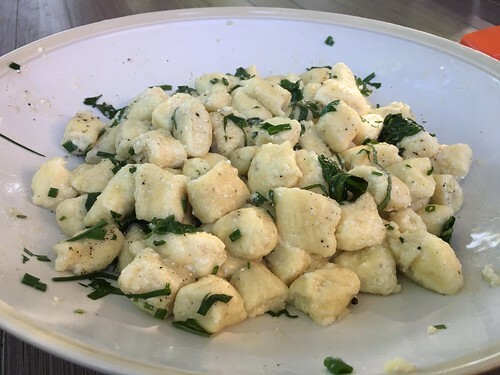 The kids, mostly Elliott, were really excited to make gnocchi again so we made a giant batch. Tossed with some fresh herbs from the garden and a little olive oil they were delicious. The kids mostly just wanted them with marinara sauce. 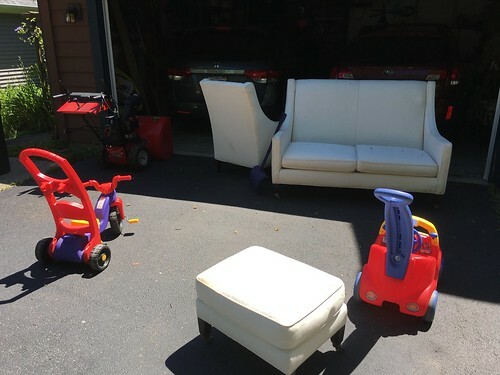 We got some great deals at our neighborhood garage sale including a nice chair, love seat, and ottoman as well as a fully functional snowblower which was essentially free. With temps entering the high 90s it was time for our backyard water park to be opened for the year. Unfortunately the children keep getting larger but our tiny, tiny pools seem to remain the same size. Sadly I've had to abandon the sugar cone which is, in my opinion, the only acceptable form of ice cream cone. I think I may finally realize why the flavorless, styrofoamesque cake cone exists: it is far more durable. Children just can't seem to handle the sugar cone without it breaking into a thousand pieces. We also had dinner in celebration of our friend Mason who would have turned 7 last week. Burgers were his favorite food and we made them in honor of his life and the impact he made on everyone that had the pleasure to have met him. 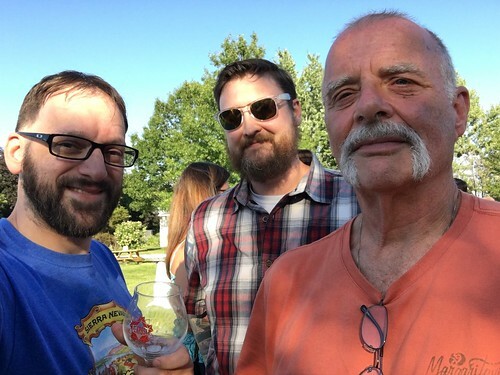 For Father's Day the fathers in the family went to Heritage Prairie Farm's Pig Gig, a pig roast and beer pairing. It was a fine evening and despite the look on my father-in-law's face I think he had a really good time. On Father's Day we took a ride to Geneva where we'd heard legend that they had a replica viking ship. When we got there we discovered that they were celebrating their 107th annual Swedish festival. So we spent a lot of time on their makeshift obstacle course, playing soccer, and battling with viking helmets and swords that were given to our children an a deep discount for no other reason than that they just amused by them. We ended by touring the Viking ship which was quite impressive. We finished off the afternoon with a very late lunch and Pokemon hunt which Martin enjoyed. Elliott, like his Grandad, often has trouble displaying his true happiness in photos.